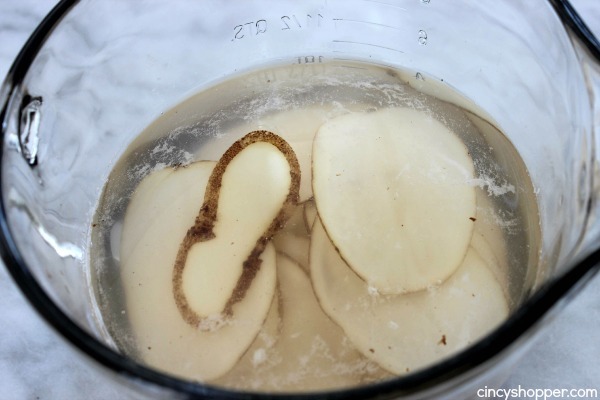 You will never want to buy store bought again after making this Homemade Potato Chips Recipe. 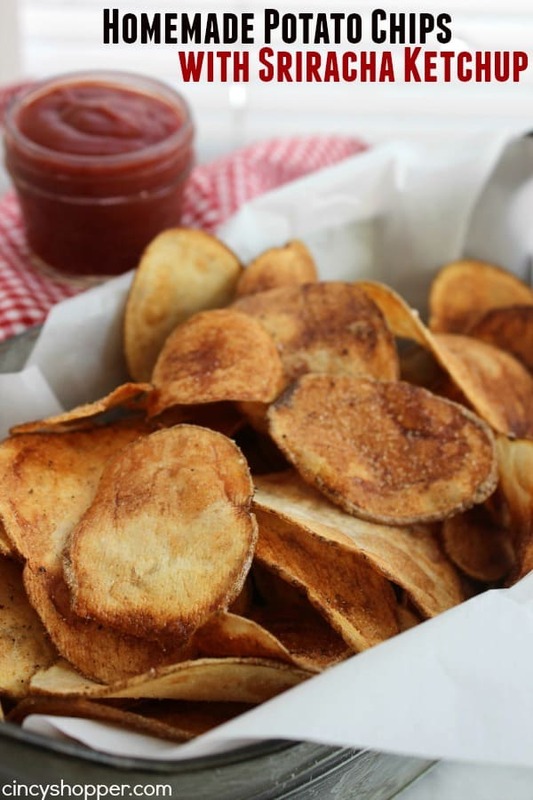 Pair these garlic salt and pepper chips with some Sriracha Ketchup and you have one heck of a snack or side dish for your meal. I honestly would never attempt to eat just one. 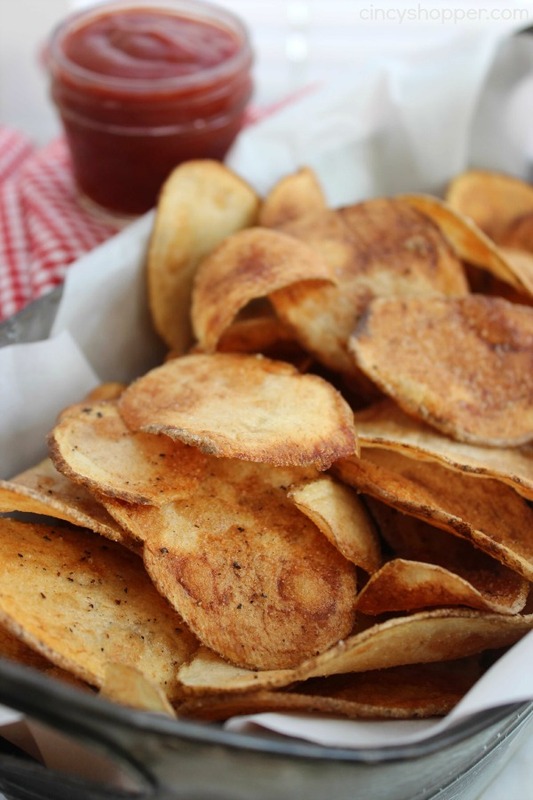 Chips are always highly addicting but these homemade chips are extremely addicting. 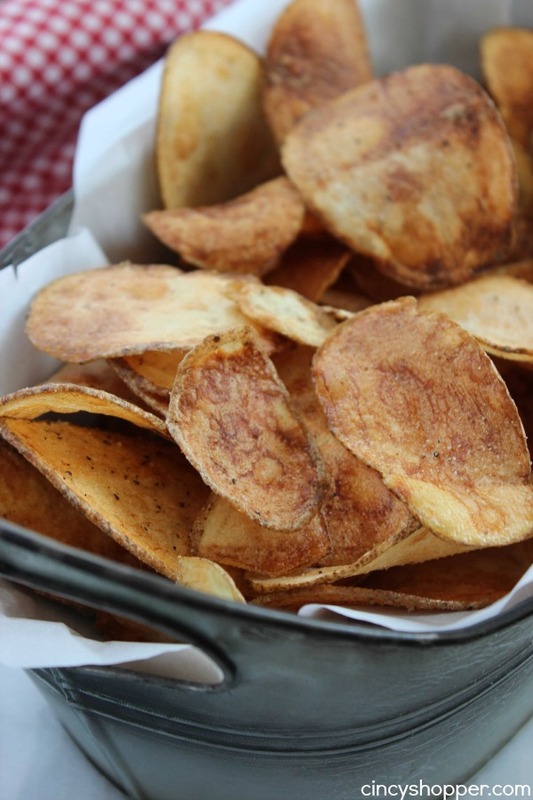 I remember the first time I enjoyed a homemade chip. My grandmother was frying up a large batch with some potatoes that she had on hand. As a child, the thought of homemade was never appealing. I grew up in the 80’s with a love for all things processed. Kraft Blue Box, McD’s Happy Meals, etc. Homemade always sounded too fresh, ha ha. 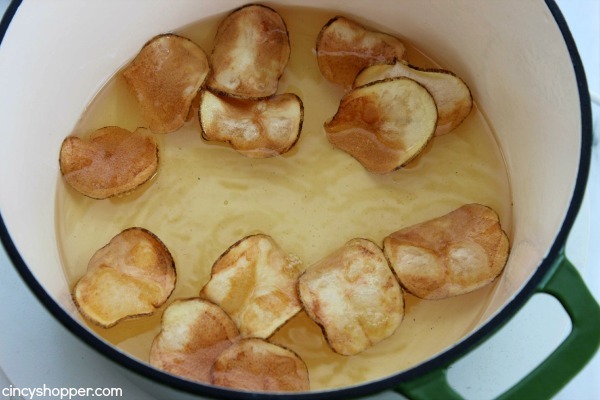 Grandma begged and pleaded with me to just give her homemade potato chips a try. To my surprise, they were better than the processed store bought chips. Mike and I were reminiscing about foods we were afraid of “giving a try” when were kids. I told him my potato chip story and before I knew it, we were making potato chips to enjoy with our burgers for lunch today. Kroger had a great sale on potatoes this past couple of week.s We scored a 3lb bag for just $0.99. I have been making quite a few potato dishes (yes, we are having quite a bit of starch this week, ha ha). 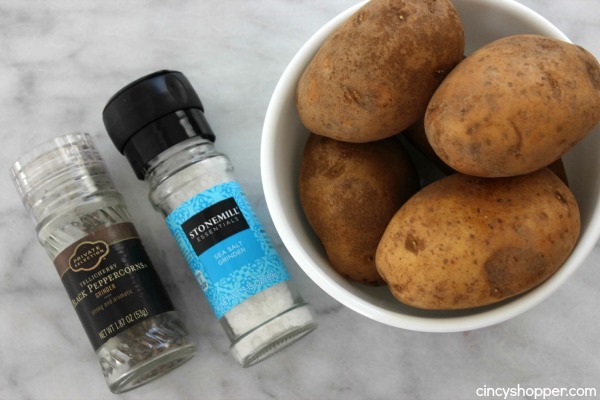 Homemade potatoes just take a little bit of time but they can be very inexpensive to make. Plus you can flavor them with your own favorite seasoning. Our next batch we make has definitely got to be salt & vinegar. My kiddos love chips and they are HUGE fans of vinegar chips. I really enjoyed the garlic salt and pepper we added today. 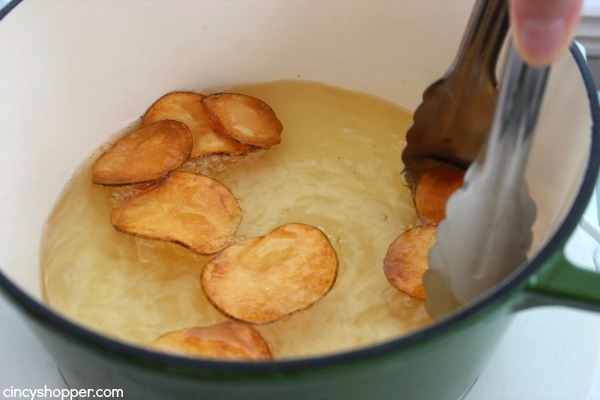 You could do them up with just plain salt and pepper if you are not a fan of garlic. 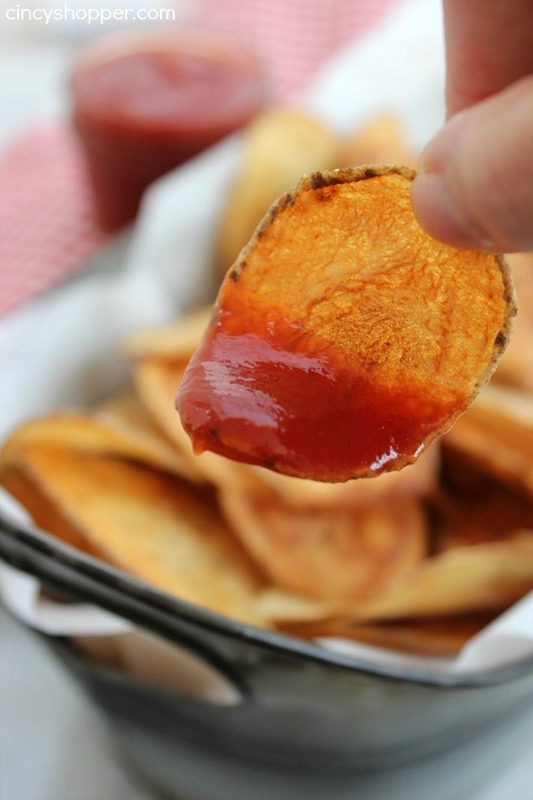 Also, eat them plain or dip them in BBQ sauce, ketchup or this Sriracha Ketchup that I shared with you gives these chips a great kick. 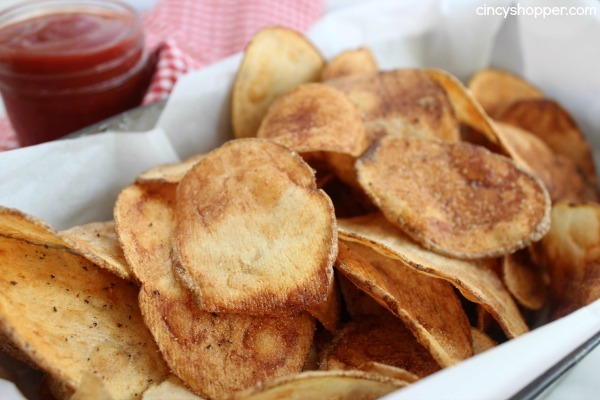 If you are local to Cincy, you have probably had Montgomery Inn Chips. I will quite often crave ribs and chips from the Inn. These chips made me think of their chips and how they could really satisfy a Montgomery Inn chip craving. 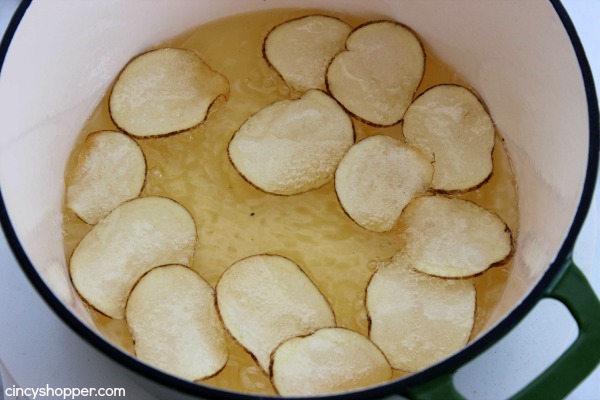 We fried up four large potatoes and it made this nice medium sized dish of homemade chips. I would probably double this recipe this summer when we are feeding a crowd. 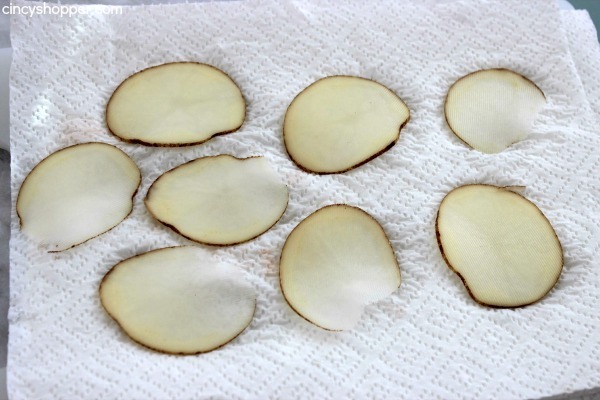 The key to an awesome homemade potato chips is making sure you slice your potatoes EXTREMELY thin. 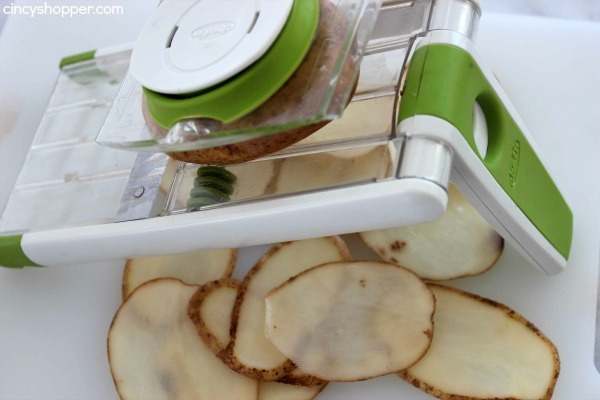 Needing a new mandolin slicer? 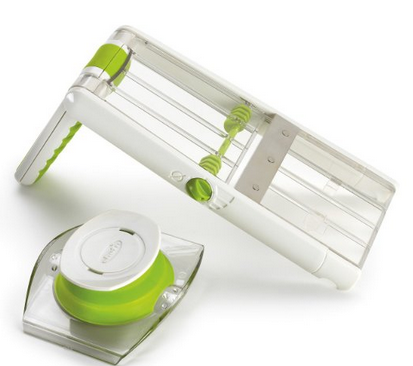 If so you can hop on over to Amazon and score yourself this Chef’n SleekSlice Collapsible Hand-Held Mandoline Slicer . We own it and it has worked great. We have purchased so many mandolin slicers and they have all found their way to the trash. This one has worked well for us. Yum yum yum! My hubby would love these! 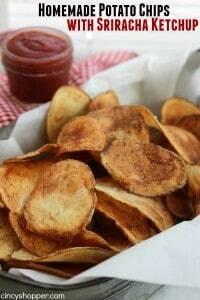 I have pinned this recipe so I can make these chips next time he has the guys over! Thanks for sharing! These look amazing! Just letting you know that I am featuring them on Best of the Weekend tonight at 8pm!